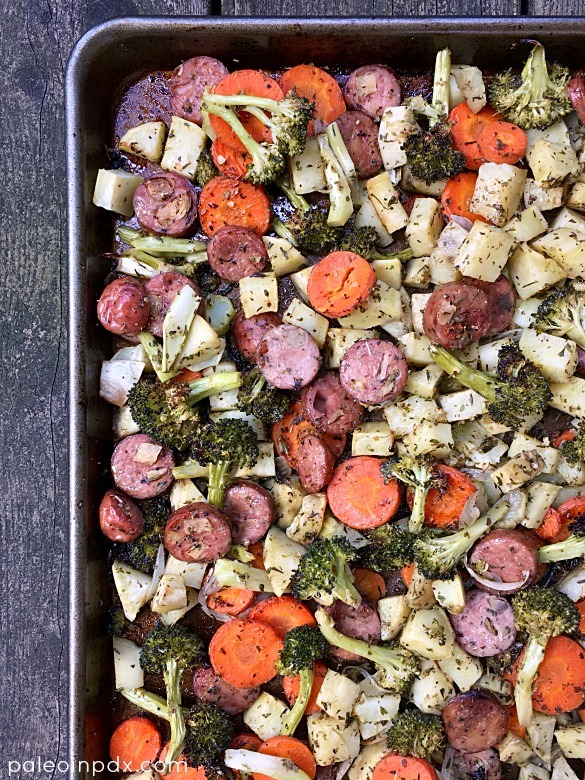 Can’t beat a simple meal like this one-pan roasted veggies and sausage. It makes for an easy lunch or dinner and involves little fuss, other than chopping the vegetables. But, that’s a very small task to accomplish to create a healthy meal. Feel free to make this dish your own by using the vegetables, sausage and seasonings that you like. It’s easy to customize and leaves lots of room for variety. In terms of the sausage, I used Aidells Artichoke & Garlic Chicken Sausage, but an Italian variety (Applegate makes a good one) would be great too. On another note, my 32nd birthday is today! Cheers, joy and well wishes to me! And, on yet another note, my husband and I leave for Iceland this Sunday! On a large baking sheet, mix together the chopped veggies (make sure pieces are uniform for even cooking), minced garlic, sliced shallot and sliced sausage. In a small dish, mix the melted coconut oil (or avocado oil) with the apple cider vinegar, oregano, thyme, parsley, cayenne, granulated onion (or onion powder), sea salt and black pepper. Pour over vegetable mixture and toss with tongs to coat. Place pan in preheated oven and bake for 20 minutes. Stir and place back in oven for another 20 minutes or until vegetables are cooked through and tender.